On the road, off the phone. It’s the law. Hands on the wheel, eyes and mind on the road. No hand-held electronic device use while driving, even when stopped in traffic or at a traffic light. No typing messages or accessing information on any electronic device. Don’t watch videos or use the camera on any electronic device while you drive. It’s the law. Washington drivers are increasingly off the phone when they are on the road. The number of Washington drivers holding a cell phone dropped by 40% from 2017 to 2018. 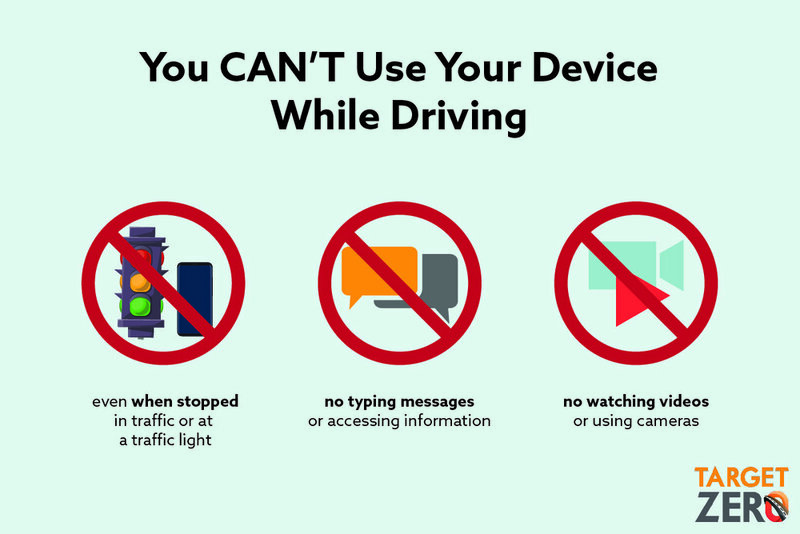 A 2018 survey in King County showed that nearly three-fourths of adults find it unacceptable to text or email while driving. Stay focused behind the wheel, it’s your only job when you drive. You can drive the distance of nearly three football fields in 30 seconds at 25 mph. That’s a long time to drive blind. Distracted driving patrols are on now – don’t be distracted by misperceptions of Washington’s Distracted Driving law – know the facts to stay focused on the drive. There will be over 150 law enforcement agencies throughout the state that will be sending out extra patrols between March 28 and April 14. If you’re distracted, law enforcement is focused on finding and ticketing you. Tickets for distracted driving go on your record and are reported to insurance. No more excuses. Holding your cell phone while driving is dangerous and illegal. Stay safe by keeping your eyes on the road and off the phone. Hands free (such as using Bluetooth) and can start use by a single touch or swipe without holding the phone. Parked or out-of-the-flow of traffic. Starting your GPS or music before you drive. Use your camera when stopped at an intersection. Text when stopped at an intersection. Change a song or adjust your playlist while driving. What can we all do to avoid the dangers of distracted driving? Turn off your phone and put it in the glove box. If you’re a passenger, hold the driver’s phone (98% say they will stop using their phone if a passenger asks). Don’t text or call a friend or loved one if you know they are driving. If using GPS on your phone, plug in the address before you start the car and use a mounted phone holder. Talk to family members about the risks of cell phone use. Model responsible behavior.